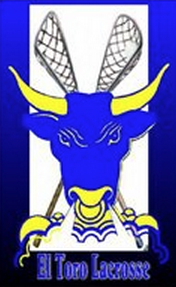 Trabuco Hills Girls Lacrosse JV dropped a match Tuesday at El Toro, 8-6. When the Mustangs stepped on the field to face off against the squad from El Toro in a rare early start, one thing was clear: those girls from El Toro were big! But would it matter? Less than 1 minute after the opening draw, the Chargers would open the scoring in an attempt to answer that question. On the following possession, El Toro would spend an extended period of time encircling the Mustang net looking for an opening and eventually exploiting one, and Trabuco Hills found themselves trailing 2-0 early in the contest. Almost on cue, the Mustangs responded. Ashly Bradshaw found herself with the ball in prime scoring position in front of the Charger net and, after a nifty spin move, buried her shot to open the scoring for the Mustangs. Irene Petruzzi showed great work on the ensuing possession, carrying the ball out of danger before hitting Hannah Moller with a nice pass; after weaving her way through a maze of defenders, Moller beat the Charger goalie with a beautiful shot to tie the score. Shelby Saino and Kody Shelton continued their excellent work on defense, controlling the front of the net and allowing goalie Sam Ransom a clear view of any shots coming in. Petruzzi was able to break free for 2 goals, and Moller was very active in both the defensive zone, lending great help, as well as vigorously attacking the Charger net minders. El Toro was able to score a goal late in the half, and Trabuco Hill held a 4-3 lead at the break. The Chargers struck quickly as play resumed, breaking in on Ransom and scoring off of the opening draw. Petruzzi was able to answer with her 3rd goal of the game, but El Toro came right back to tie the score at 5. Saino and Shelton anchored another solid defensive stand; however, inconsistent play by the Mustangs started to take its toll, and a number of dropped passes prevented any sort of sustained attack on the Charger goal. With the score still tied, El Toro became quite undisciplined, fouling frequently, but Trabuco Hills was unable to capitalize. 2 yellow cards resulted in the Chargers being forced to play short a player, yet it was El Toro who was able to score a short-handed goal off of a Mustang turnover. After a time-out, the Mustangs were able to mount strong pressure on the Charger goalie, with Petruzzi causing a key turnover deep in the El Toro zone; unfortunately, a shot off the post was retrieved by the Chargers and turned into a long run that ended up with the ball in the back of the Mustang net. As Trabuco Hills struggled to find their offense, El Toro was content to hold the ball and patiently wait for any cracks in the Mustangs’ defensive shell. When one appeared, they took advantage of it to make the score 7-5. Unable to gain and maintain possession of the ball, the Mustangs ran out of time and El Toro walked away with a victory. Next game: Hosting San Clemente, Thursday.